Earth from Space is a free eBook describing our planet from a satellite's perspective. Fore more information, please read the About pages. The approximate boundary between Europe and Asia is defined by the Ural River and the Ural Mountains to its north. The Ural River flows to the great, inland Caspian Sea, and gives its name to the city of Uralsk on its banks. 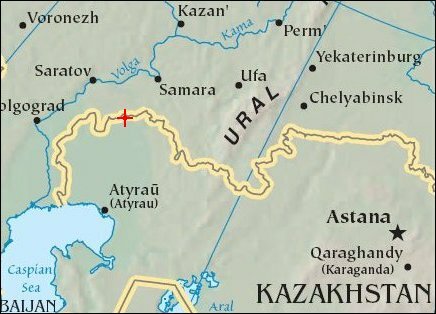 Lying just inside the Kazakh border with Russia, Uralsk is an agricultural and industrial center, and has been an important trade stop since the early 1600s. Barge traffic has passed up and down the Ural River between the Caspian Sea and the Ural Mountains for centuries. Today it is one of the major entry points for rail traffic from Europe to Siberia, servicing the many new oil fields in the Caspian basin and the industrial cities of the southern Urals. 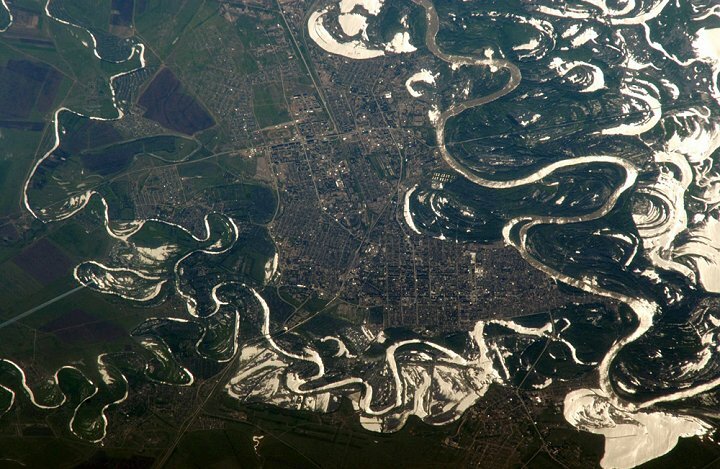 International Space Station astronauts acquired a series of images of Uralsk, highlighting the city under different lighting conditions. The upper view shows the sunglint (light reflected from the water surface towards the observer) on the rivers, lakes, and ponds of the Ural floodplain (right side of image) and that of a tributary, the Chogan River (bottom). The cityscape of Uralsk, on the headland between the two, is relatively difficult to see because the water and sunglint dominate the scene. The lower view was taken 48 seconds earlier, at a more vertical angle that was not affected by sunglint. 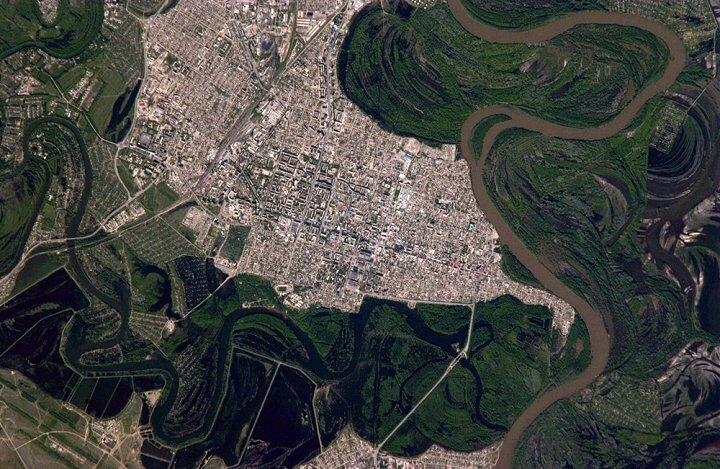 The different lighting geometry between the two images reveals numerous details, including the city margin, city blocks, and even the causeway and individual buildings. The green, vegetated parts of the floodplains, and black, inundated parts (lower left, bottom image) stand out clearly. The brown Ural River waters contrast with the darker color of its tributary, the Chogan River (lower image). The rivers, swirls of ancient meander scars, and ponds are the only features that stand out clearly in both images.